A few weeks back, we were lucky enough to spend time with one of our biggest muses of the moment. With our current marketplace changing so rapidly, conquering multiple career paths and passions in a sustainable manner is key, and we believe Sophie Hellyer is heading in the right direction. Born in Devon and a keen surfer, Sophie Hellyer is an unstoppable force of nature with a strong, yet much-needed mindset to adhere to. When Sophie isn’t surfing or tackling world issues on TedEx, she can normally be found in water; ponds and reservoirs, swimming and doing cold water dips. She plays football a couple times a week and for work is usually writing or occasionally producing photo-shoots for brands. L: How did you get into surfing? S: My dad and sister surfed and I was lucky enough to grow up by the beach so learning to surf was just a natural thing for me. I started competing when I was about 15, when I won the British School and English Nationals, I competed for several years when I was younger and through my university years, and I competed on the English and British team a couple of times. L: What is the feeling it gives you? S: Surfing, just being in the ocean, has the complete power to change my mood in a second, if I’m tired it wakes me up, If I’m anxious it calms me down, if I’m stressed it relaxes me. That feeling of being weightless in salt water and surrounded by nature is magical. The ocean is where I am most comfortable, where I feel myself, where I am grounded and happy and creative and calm. L: What are you most passionate about? S: I’m passionate about protecting our oceans, being on the beach and in the sea so much I really see first hand the negative effects of plastic pollution. I’m also passionate about equality, and making sure everyone has access to their full potential regardless of their gender, race, ability or class. S: A daily cold water sea dip is my medicine, it keeps me feeling healthy and connected. If I can’t make the ocean I try to practice yoga, or go for a run. It’s not quite the same as the sea but exercise definitely releases the happy hormones that keep me going. S: Errr,… I’ve had a used sanitary towel land on my surfboard before. And condoms. Not an epic story, but apparently 3.9million period products are flushed down UK toilets every day, and they all contain plastic. Gross all round! S: I headbutted my fins a few years ago and head to have my face stitched back together, I was told I needed plastic surgery but the surgeon doesn’t work on Sundays, so I just have a good collection of scars over my forehead now. L: When you’re having a bad day, where does your mind go/how do you carry on/ what pushes you through? S: I know my fixes now, if I am having a bad day, it those things like swimming, yoga, running, reading, writing… they are the things that pull me back out. If I find I’m stuck in a bad place I have a really good therapist I go to sometimes, mental health is so important. L: Any tips for anyone unsure of getting in the water or starting surfing? S: Find a friend, its always more fun learning something or taking on a challenge with a buddy. And if it’s your first time surfing, or you are struggling to progress, invest in a lesson or two, it’s really handy to have someone help. L: Knowing you are a passionate environmentalist, among many other things, what is your biggest/ best piece of advice to anyone who is new to this much-needed movement towards sustainability? S: There are so many simple swaps we can make in our everyday lifestyle choices that can have a big impact. It doesn’t need to be anything huge, but things like carrying a reusable coffee cup or your own water bottle, saying no to plastic straws, choosing to buy a bamboo toothbrush. It’s these thoughtful small actions, that If we all start to make them, can collectively have a big impact. S: So much. At the moment I’m involved in #plasticfreeperiods, a campaign to encourage people who menstruate to change from traditional period products that contain single-use plastic, like tampons and sanitary pads, to reusable alternatives, like menstrual cups and period pants. 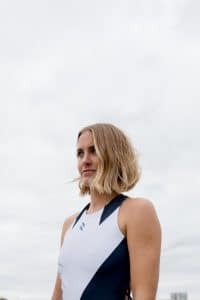 I post most things I’m passionate about on my blog, so keep an eye on www.sophiehellyer.com for overly honest product reviews and current affairs of women in sports.